Jews – Len Bilén's blog, a blog about faith, politics and the environment. U.N. votes to condemn Israeli settlements. U.S. abandons Israel, a Limerick. The Obama administration on Friday allowed the U.N. Security Council to adopt a resolution demanding an end to Israeli settlements, defying pressure from U.S. President-elect Donald Trump as well as Israel and several U.S. senators who urged Washington to use its veto. between Jews and their foes. He wants war, and it shows. The verdict: He’s held in derision. Both Senator John McCain and Chuck Schumer in a rare agreement is condemning the vote to no longer support Israel. President Elect Donald Trump’s tweet on the matter: As to the U.N., things will be different after Jan. 20th. As to soon to be ex President Obama, he prefers the applause from the 57 Muslim states rather to work for a lasting peace in the Middle East. Members of Congress threatened to de-fund the UN. The U.S. accounts for some 22% of the UN’s budget, supporting a large, comfortable bureaucracy and its various programs. This provocative action by the United Nations is an outrage and must be dealt with sternly and forcefully. As the Chairman of the Subcommittee on Foreign Operations of the Senate Appropriations Committee, I oversee the United States assistance to the United Nations. The United States is currently responsible for approximately 22 percent of the United Nations total budget. If the United Nations moves forward with the ill-conceived resolution, I will work to form a bipartisan coalition to suspend or significantly reduce United States assistance to the United Nations. 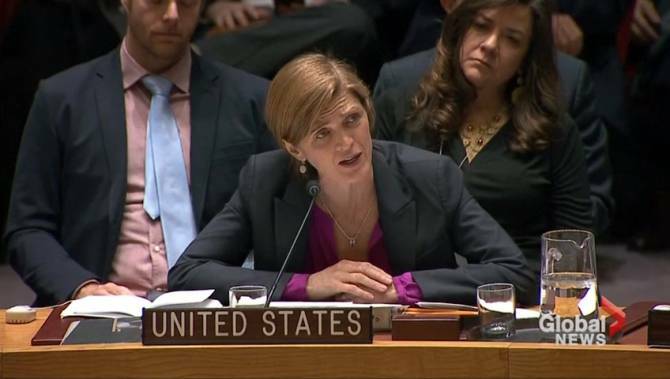 By allowing the United Nations’ anti-Israel resolution to be adopted by the Security Council, in the face of fierce bi-partisan opposition, the actions of the Obama Administration will forever be remembered as a dark, shameful moment for our country. The resolution passed today will only serve as a greater barrier to peace, which can only truly be achieved through negotiations. Instead of pressuring the Palestinians to be a partner for peace, President Obama chose to break with long standing diplomatic practices and allowed the one-sided, anti-Israel United Nations to be used as a tool to bludgeon Israel, our greatest ally in the Middle East. We applaud the efforts of Republican Senators, led by Senator Graham, to strip funding to the United Nations, which has time and again showed their anti-Israel bias. What happened today will forever be on the heads of the President, his Party, and groups like J Street that remained silent. Posted on December 23, 2016 December 23, 2016 Categories Donald Trump, limerick, Obama, PoliticsTags defunding U.N., Donald Trump, Israel, Israeli settlements, Jews, Limericks, Obama, politics, U.N.Leave a comment on U.N. votes to condemn Israeli settlements. U.S. abandons Israel, a Limerick. Obama blames Russia for Hillary’s loss. Soon to be ex-president Obama is at it again. First he used U.S. taxpayer money to try to prevent the re-election of Israel prime minister Benyamin Netanyahu. Netanyahu won in a landslide. Then he went to London to say “If the U.K. voted to leave the E.U, Britain would be left back in the queue”. Brexit won convincingly. He campaigned hard for Hillary Clinton and ridiculed Trump as much as he could. Trump won in an electoral landslide. He is now searching for a villain other than himself. He thinks he has found it in Russia. Blame Russia like Hitler blamed Jews. He said he directly confronted Russian President Vladimir Putin about a potential US response, and said his counterpart acknowledged his stance. Posted on December 15, 2016 Categories Donald Trump, limerick, Obama, PoliticsTags Donald Trump, election, Hitler, Jews, Limericks, Obama, politics, Putin, RussiaLeave a comment on Obama blames Russia for Hillary’s loss. Verse 51 of the Obama Impeachment song. When the Iran deal fails, blame the Jews! Secretary of State John Kerry is sounding the warning that Israel will be “blamed” if Congress opposes the Iran agreement. Secretary Kerry made his remark in an address to the Council of Foreign Relations on July 24. He appeared to be not merely predicting that Israel might be blamed, but hinting that the Obama administration itself might do the blaming. The possibility that the blame would be extended to Israel’s supporters in the United States has already been raised by President Obama himself, in his warning that unnamed “lobbyists” and “money” were trying to block the Iran deal. When this deal fails: Blame the Jews. Iran gets nukes, will blow the fuse. World War III will be the news. The Christians are gone, I win, they lose. Posted on August 3, 2015 August 3, 2015 Categories Christian, eligibility, faith, Muslim, Obama, politics, songTags Christians, impeachment, Israel, Jews, Kerry, Obama, politics, song, World War IIILeave a comment on Verse 51 of the Obama Impeachment song. When the Iran deal fails, blame the Jews! Verse 37 of the Obama impeachment song: Obama’s Jihad against the Jews. Verse 37 of the Obama impeachment song: Obama’s Jihad against the Jews. (As if sung by Obama to the tune of “Please release me, let me go”). I gave their secrets to the news. So try to impeach; what’s your excuse? Posted on March 26, 2015 March 26, 2015 Categories Obama, Politics, songTags impeachment, Jews, Jihad, Obama, Obama Impeachment, politics, songLeave a comment on Verse 37 of the Obama impeachment song: Obama’s Jihad against the Jews.